For over 20 years, Lyons Contracting has been providing high-quality roofing using the country’s top materials. We make it our goal to fulfill the expectations of every homeowner regarding their roofing project. We dedicate ourselves to constant innovation, hard work, integrity, and reliable service. Best of the Best Television recognized these attributes, which led them to name our company as the Best Business of 2015. We partner with the biggest brands in the industry and pass their extensive warranty packages to our customers. We are certified and trained to handle their products, which makes us the leading choice for metal roof replacement in Fairfax, VA, and other services. This way, you can be confident that your project will receive precise and careful planning and implementation. Our ceaseless efforts in improving the quality of our services earned us A-ratings from renowned organizations, such as the Better Business Bureau and Angie’s List. To ensure the utmost performance of the roof replacements we install, we continuously attend training sessions and adopt the latest roofing techniques. Many homeowners attest to our excellent craftsmanship, clear and friendly communication, and first-rate customer service. In all the projects we work on, our main priority rests on the satisfaction of our clients and reinforcing their home’s protection. 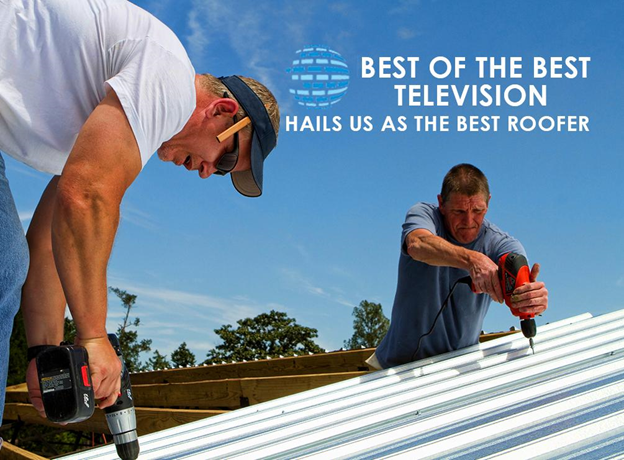 Our national recognition from the Best of the Best Television shows who we are as a roofing company. Our expert crew and industry-leading trading partners are the reasons we stand out from other roofing contractors. For slate roof repair in Alexandria, VA, and other roofing needs, call us today at (703) 457-6560. You can also book a schedule for a free in-home consultation.